There is a sequence of inscriptions "#Latvija", "#ripsakta", "#3_4gs", "5 euro" and "#2016" within the central field. The reverse features a stylised image of disc fibula. The coin replicating a 3rd–4th century disc fibula is the first in the series of euro gold collector coins dedicated to Latvia's brooches and the country's centenary. In the jewellery sets of the people of Latvia brooches appeared at the time when the east Baltic territory and its inhabitants were first mentioned in recorded history. In his work Germania, Cornelius Tacitus (56–117) mentioned the Aests, neighbours to the Germanic people, who collect amber – "(..) pick it raw, take it to the market rough and are surprised to receive payment. "Amber was one of the barter goods, which also helped cultural contacts to flourish. As a result of these contacts, Roman coins appeared in the east Baltic region as did objects produced in the provinces of the Roman Empire, particularly jewellery. The history of the brooch in the territory of Latvia began with various brooches from the early Iron Age (1st–4th century AD) – the so-called eye fibulae, tutulus fibulae, cross-ribbed fibulae, arbalest fibulae and round disc fibulae with openwork wheel, cross and fire cross motifs. The older brooches were imported, but soon the local craftsmen began to use them as models to make their own brooches, with their form reflecting the local aesthetic and mental concepts. Brooches were used to fasten and adorn clothing by all – men, women and children. The form of and ornamentation on brooches also served a protective function (jewellery as amulet). The form, size and material may have changed, yet the brooches have remained popular until the present day. The disc fibula, a singular find in Dzelzava's Jaunzemji graveyard in Madona region, is cast in bronze, like all other brooches of that age. It is made in the openwork technique and is both laconic and luxurious at the same time: the openwork on its disc surface forms a complex geometrical ornament. The shiny bronze surface of the disc fibula and the contrasting material of the clothing seen through the openwork were very decorative. 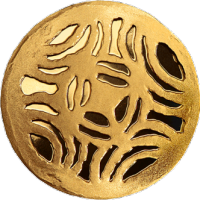 The disc fibula and its ornamentation may have also served as an amulet, reflecting the sun cult which was gaining importance in the crop-growing society. It is also associated with rotation, dynamism and continuity.